March is quickly approaching. That means the debut of our exhibit, Emerald Expressions, at the Ludington Area Center for the Arts. Our opening reception will be at 7 p.m. on Saturday, March 3. The exhibit will continue through April 7. Thursday, March 8: “Emerald Expressions,” Photographer’s Journal. 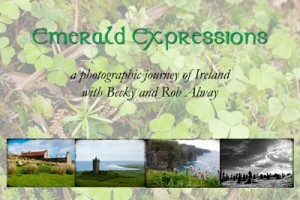 Rob will discuss the photographic journey he and Becky took last May and how they created the images in the exhibit. 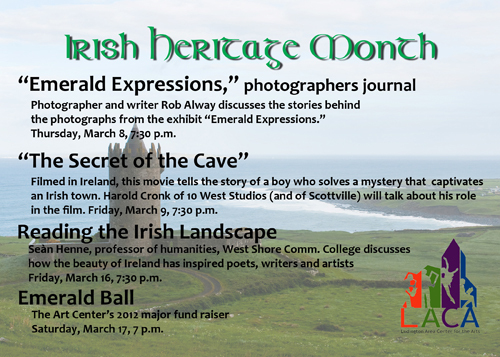 7:30 p.m.
Friday, March 9: “Secret of the Cave” film screening. Scottville native Harold Cronk, co-owner of 10 West Studios in Manistee, will talk about the movie “Secret of the Cave,” which he served as production designer. The movie was filmed on Achille Island, County Mayo, Ireland, which is also where many of the photographs of “Emerald Expressions” were created. 7:30 p.m.
Friday, March 16: “Reading the Irish Landscape.” Professor Seàn Henne of West Shore Community College will discuss how the Irish landscape influences poetry, art and photography. Professor Henne majored in Irish Studies at Boston College. He is of Irish decent and has traveled there several times. Saturday, March 17: Emerald Ball. Celebrate St. Patrick’s Day in style as the Ludington Area Center for the Arts holds its annual major fundraiser. The event will feature the General Assembly big band.